Thanks to off-the-charts inflation, Venezuela will probably retain the dubious honor of being the most miserable economy for a second year. Galloping inflation at an annual average of 98.3 percent last year alongside 6.8 percent unemployment earned the South American country the runaway top spot on the 2015 misery index. 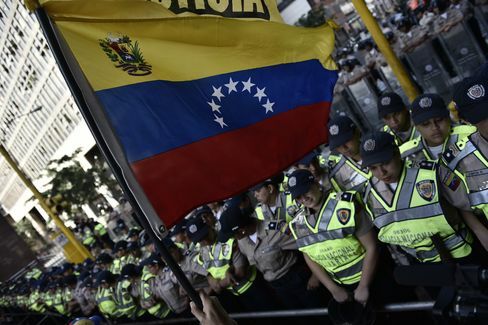 With no end in sight for Venezuela's economic woes — estimates in Bloomberg surveys predict consumer price growth of 152 percent and joblessness averaging 7.7 percent — economists polled for the 2016 index see it remaining the unhappiest country. The ranking of 63 economies is compiled by adding a country's jobless rate and inflation, a long-standing calculation in which a higher score indicates more misery. Venezuela's 159.7 tally for the 2016 misery index done by Bloomberg quadruples the next-worst ranking Argentina. The global slump in crude prices has been especially destructive in Venezuela, where oil makes up 95 percent of exports. Falling revenue is further weighing on budget strains, as Venezuela owes as much as $10 billion in foreign bond payments this year. President Nicolas Maduro, who has declared an "economic emergency," told lawmakers last month that it was time to raise gasoline prices and that he'd look at adjusting fixed currency rates. Prices at the pump in Venezuela are the cheapest in the world, even as costs for everyday items and luxuries are surging — a dinner for two at a nice restaurant might demand more than a month's worth of minimum wage. Meanwhile, Maduro's new economy minister has said that price growth doesn't exist in "real life," blaming speculation, usury and hoarding among the business class. In Argentina, authorities are in the midst of overhauling the national statistics agency and have stopped reporting some economic indicators until that's done, after being accused for years of releasing dodgy data. 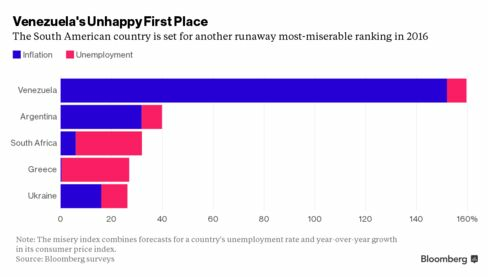 While Venezuela and Argentina are tackling inflation, rounding out the top five unhappiest economies in 2016 are those desperately trying stop unemployment from deepening: South Africa, Greece and Ukraine. Elsewhere in the world, the picture isn't quite as bleak. There were success stories last year, with Poland ranking No. 42 on the scale, versus a No. 19 spot initially projected at the start of 2015, in part due to lower-than-expected joblessness. But 2016 might see Poland climb the misery index amid an increasingly uncertain fiscal and economic outlook (including a possible debt downgrade) caused by the new ruling party's costly campaign promises. The world's happiest economies this year will look similar to last year's rankings. Thailand, in part due to unique structural issues that allow more people to count as employed, will stay as least miserable. Singapore, for which survey data is newly available this year, will debut at second-best. Switzerland, Taiwan and Japan will keep top-five status from 2015. Switzerland's case is cautionary for fans of the misery index: While the Swiss are slated to enjoy continued low joblessness, economists see falling consumer prices this year. Discounts can be great for consumers, but also could portend deeper problems within the economy. Switzerland, for its part, is still trying to maintain currency stability since dropping its currency cap a year ago. Economists are looking for signs of improvement in Russia, Romania, and Ireland — each of which will achieve a more favorable position this year, according to the survey. After contracting by 3.7 percent in 2015, on the back of sinking oil prices and inflation-dampened consumer spending, economists expect a gradual "L-shaped" recovery for Russia, with the world's largest energy exporter seen returning to 1.3 percent annual growth in 2017. Misery index calculations were compiled using the median estimates in Bloomberg economic surveys from the past three months. Figures for 2015 inflation and unemployment data reflect the average over the year and use the most current data available for each country.